Packed with information in an easy-to-read format, this valuable resource is ideal for any experienced DBA. Even database programmers who deal with Oracle will truly appreciate having the Oracle Utilities Pocket Reference close at hand.Authored by Sanjay Mishra, a foremost authority on Oracle systems, this convenient and compact guide is focused and to-the-point, eliminating any potential guesswork or difficult memorization. 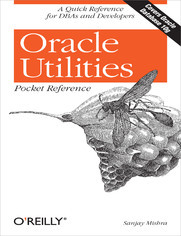 The Oracle Utilities Pocket Reference is part of the strong-selling collection of O'Reilly "pocket reference" books.